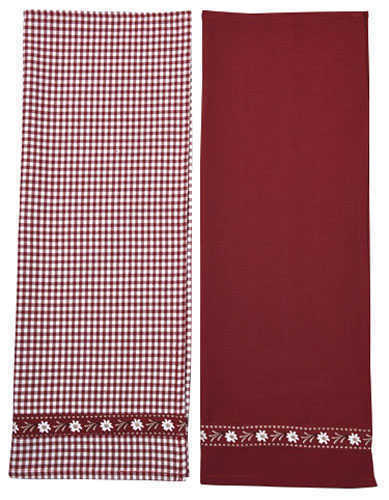 100% cotton towels feature complementary burgundy and a burgundy/white checked fabric with Edelweiss accents. Washable. 20" x 28"size in a two towel set. Service Area: New Glarus, Janesville, Rockford, Machesney Park, Middleton, Stoughton, Baraboo, Fort Atkinson, Roscoe, Oregon WI, Platteville and surrounding communities.